Delicious, wholesome recipes like this easy chili mac and cheese recipe are the way to my heart. This simple, hearty, homemade chili mac and cheese is a regular on our family’s dinner menu. We love this recipe and think it’s the best! You’ll enjoy the flavor of the spices, cheese and pasta blending together perfectly. Staple ingredients you’ll have on hand — like seasonings, onion and beans — come together in just half an hour for a quick meal on those busy nights. This beefy, cheesy perfection is an amazing one pot meal and tastes great when paired with a delicious, slightly sweet cornbread. I’m confident it will become an often requested favorite for your gang as well. It goes so well with cornbread or cheese biscuits as well as dinner rolls or even beer bread. 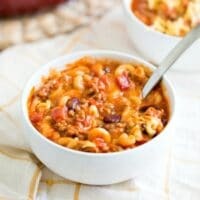 One of the great things about this homemade chili mac is that I almost always have all the necessary ingredients on hand. It’s one of those staple meals in my house that I turn to on a busy night when I want something hearty and delicious for us to all enjoy. 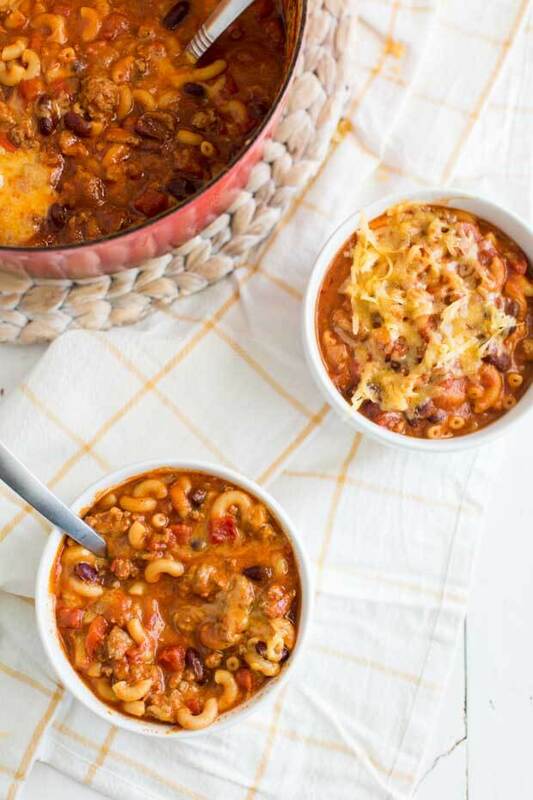 This beef and bean chili is also one of my favorites. I make my chili mac with ground beef. You could also make it with ground turkey. You’ll need an onion and kidney beans too. 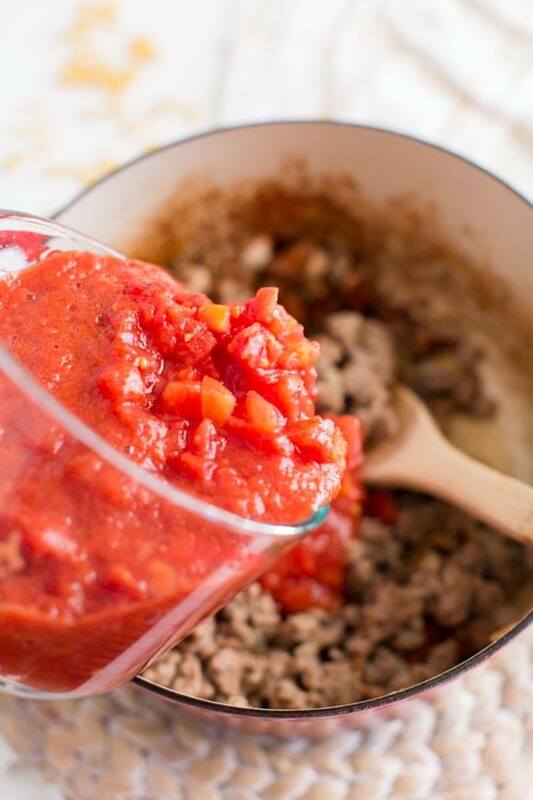 You’ll also include tomato sauce (recipe to make your own here), diced tomatoes and tomato paste. 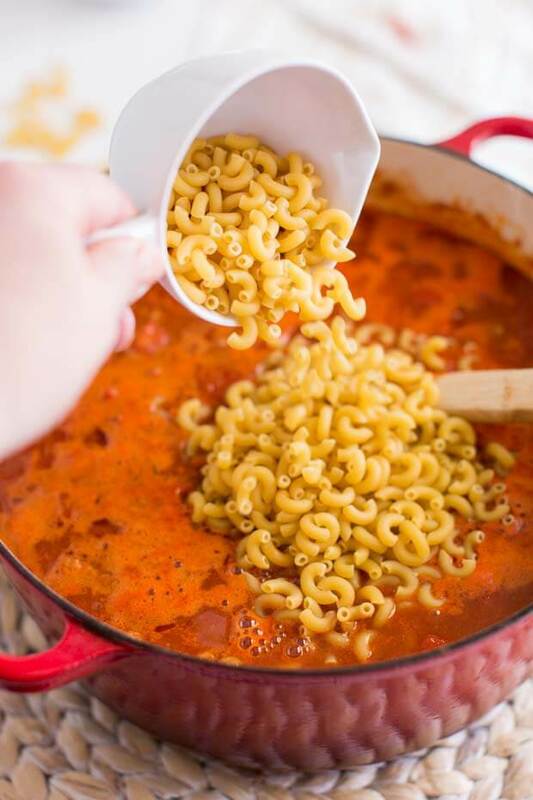 From the pantry, we’ll be including elbow macaroni. The spices are chili powder, onion powder, garlic powder, cumin, paprika, salt and white pepper. You’ll also add in a dash of baking soda. Grab some shredded sharp cheddar from the fridge before you get started, too! My boys would happily eat pasta for every.single.meal if I let them. Spaghetti is often requested for breakfast even. I’m always look for new recipes to try out so that they don’t just eat pasta three meals a day. This lasagna casserole is another often requested favorite in our house. 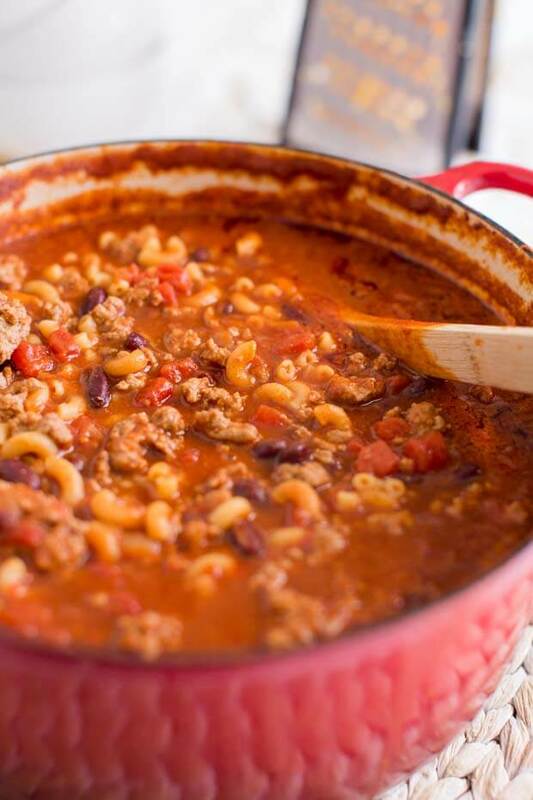 This hearty, beefy chili mac and cheese recipe with beans is a new favorite. It’s ready in an easy half an hour and it’s packed with all our favorite flavors. And if you happen to have leftovers, they serve great again the next day. Did I mention how simple this comes together in only half an hour? Perfect for those busy nights. You start by sauteing your onion and then browning the ground beef. Next up, you’ll add in all your spices (except for the baking soda) and stir continuously for a couple of minutes. After that, you’ll pour in all your tomato products and some water. Bring to a simmer over medium low heat and let it cook for about 10 minutes. Add in the baking soda and watch the sauce bubble up for a moment. (The boys always love that part!) Continue stirring over the heat for a moment until the bubbles go away. Finally, stir in the kidney beans and pasta. Simmer until the elbow macaroni is al dente. Remove from heat and sprinkle cheese on top and let it melt. Stir and serve — I suggest topping each bowl with more cheese as well. Because is there such a thing as enough cheese? No. If you feel the same way, you need to check out my cheesy crockpot mac and cheese recipe. 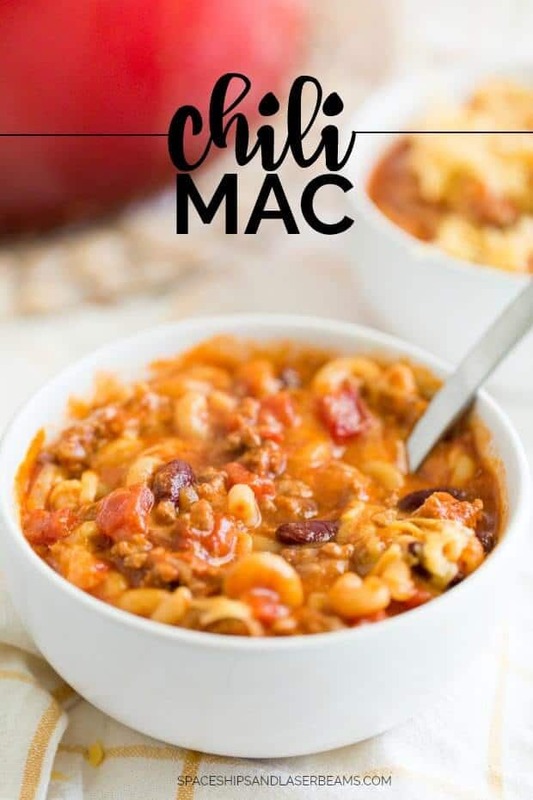 You can definitely get creative with this hearty mac n cheese chili meal. 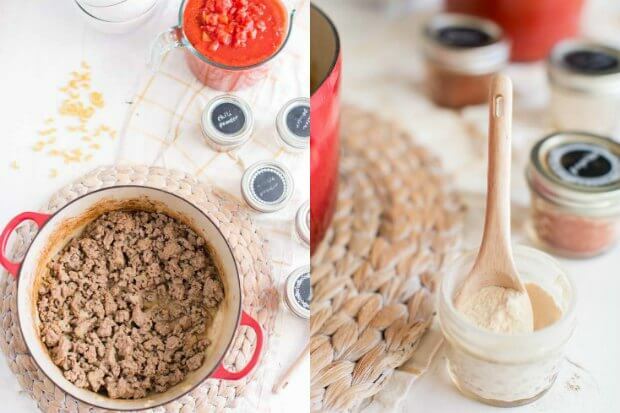 Instead of just ground beef, you could use ground turkey or even mix in sausage or ground pork. Sometimes I like to add peppers to my beef macaroni and cheese. I’ve also experimented with different cheeses instead of just sharp cheddar. A dollop of sour cream on top is also delicious. You could also make it strictly vegetarian by eliminating the ground beef (or other meat) and increasing the amount of kidney beans and noodles. That’s also a great way to stretch your budget! We’re all about the bread in our house, so chili mac gets served with a sweet cornbread topped with lots of butter. We also love it with a simple side caesar salad. My favorite dessert with this dish is blueberry cobbler. I love the sweetness balancing the beefy, cheesy, tomato sauce of chili mac and cheese. I’m confident your family will love this delicious meal as much as we do. This recipe was seriously so delicious! My entire family loved it! Thanks for this recipe! my daughter really loves it! Years and years ago I made Chili Mac without a recipe. Recently I’ve tried to duplicate and make again, but it just didn’t taste the same. Wow, your recipe hit the jackpot. Now, I can enjoy it again. Super simple to make and very filling! I have not made chilli Mac in years! Wanted to make it but could not find my recipes. This recipe is on point and amazing. Seasonings we’re perfect. I made some adjustments in the amount of chilli powder due to my heat tolerance. Also I reduced the amount the amount of water from 5 cans to 3 cans. I all five stars. This looks amazing! 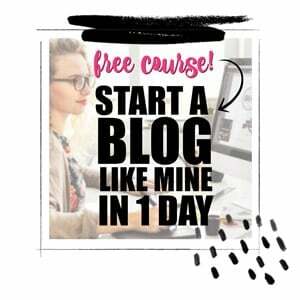 I plan to make it…. I’m curious as to the role that the baking soda plays? It helps cut down on the acidity of the tomatoes!